In our ever too complicated lives, we crave simplicity. I know I do, and I have a feeling you may do too. That’s why we’ve made it our mission, as a team, to un-complicate cyber security so anyone can be safer online. We first did it through the Cyber Security for Beginners course that has surpassed the 5000 attendees mark. But we wanted to help cultivate online security as a healthy (and necessary) habit even further. With the beginners’ course, we wanted to help you really take the time to understand how it all works together: software, hardware, cyber crime, our habits and our psychology. The lessons are packed with advice to follow step by step. But even the best intentions can suffer for lack of follow through. Most of my healthy eating decisions ended up that way. So we rubbed our heads together to come up with a way to help you improve your cyber security bit by bit. This is how The Daily Security Tip was born. Plain and simple: you sign up using your email address and we’ll send you a new online safety tip each day, for a full year, for free. That’s 365 tips to gently help you better protect yourself on the web. The tips are short, simple and actionable. They’re written in plain English, so there’s no mumbo jumbo involved. We’re here to cheer you on your way to a more secure online experience. We’ll (try to) make you smile when you start changing your passwords to make sure they’re safer and not the same. We’ll even scour the web for the best GIFs it has to offer, so you can see that cyber security can be not boring and even fun (gasp!). 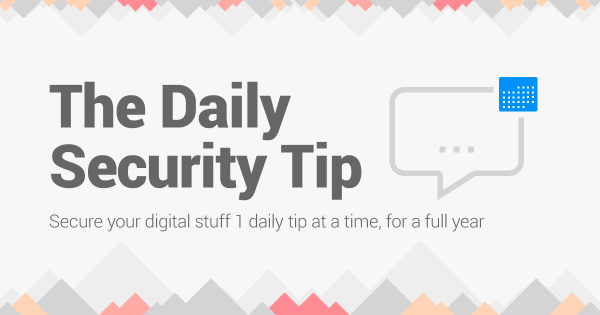 Keeping things simple (but effective) is the best approach in our book, and The Daily Security Tip is a reflection of that. But don’t take our word for it – subscribe and see for yourself. Thanks for the resource Loana. I will definitely learn. I have learnt a lot of online safety stuff and would like to know whether there is a way I can stay vulnerable while offline. Thanks.